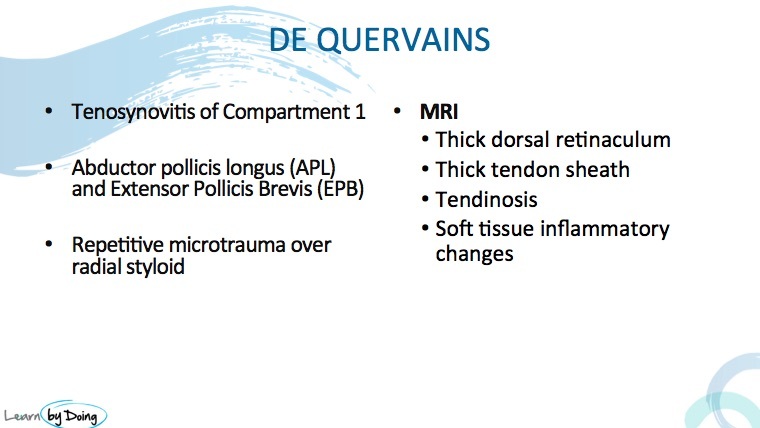 What is the MRI appearance of De Quervain’s Tenosynovitis of the wrist. A quick review of the anatomy and the MRI appearance. Image Above: Compartment 1 of the Wrist consists of the Abductor Pollicis Longus- APL and the Extensor Pollicis Brevis-EPB. Repetetive micro trauma to the tendons over the radial styloid results in inflammatory changes in the tendons and sheath. 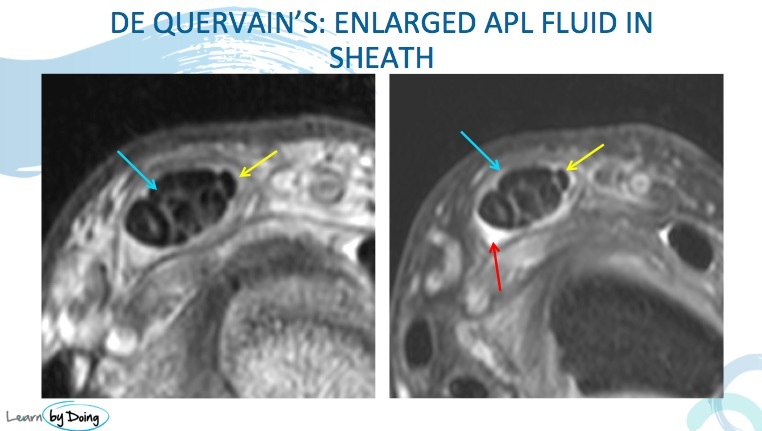 The MRI features of de Quervains are what you would look for in any tendon inflammatory change: Tendon hyperintensity, enlargement, fluid in the tendon sheath and thickening of the sheath. When sever the inflammatory changes can spread to the surrounding soft tissues ( see last image). 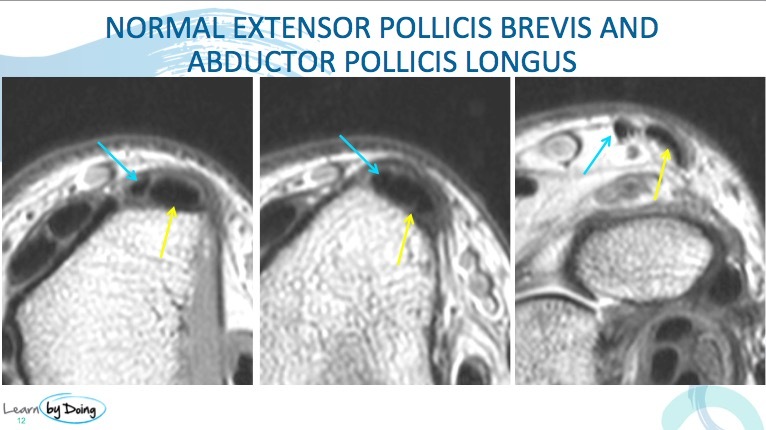 Image Above: Normal low signal appearance of the Abductor Pollicis Longus- APL( yellow arrow) and the Extensor Pollicis Brevis-EPB ( Blue arrow). APL is normally much larger than the EPB. No fluid in tendon sheath and sheath is thin and low signal. 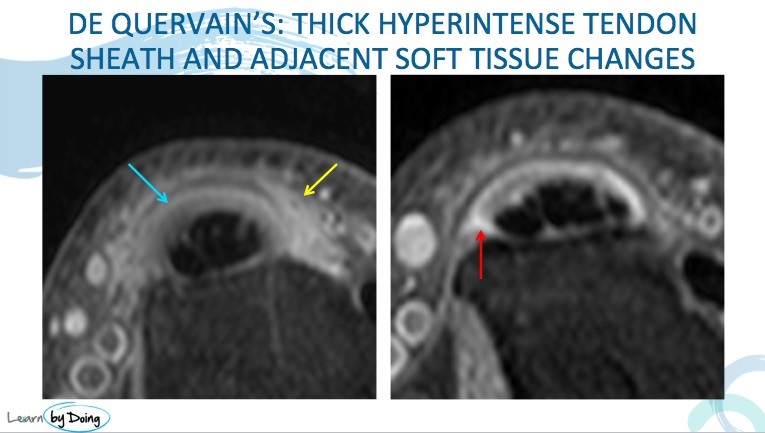 Image Above: Markedly enlarged APL ( blue arrow) with non fluid signal hyperintensity in keeping with tendonosis. Mild fluid in tendon sheath ( red arrow). EPB normal ( yellow arrow). 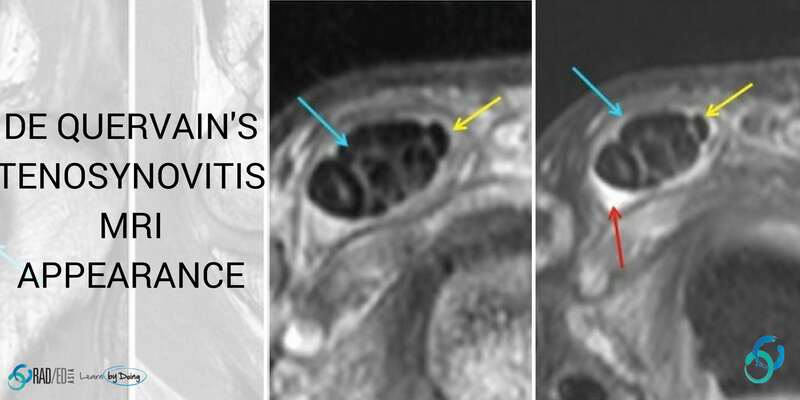 Image Above: Thickened and hyperintense tendon sheath ( blue arrow) with spread of inflammatory changes to adjacent soft tissue ( yellow arrow). Mild fluid in tendon sheath ( red arrow).